Come home to the coastal casual look of the slipcovered Peyton sectional from the Two Lanes collection. This inviting modular sectional exudes transitional charm with its classic roll arms, box edge cushions and skirted base. 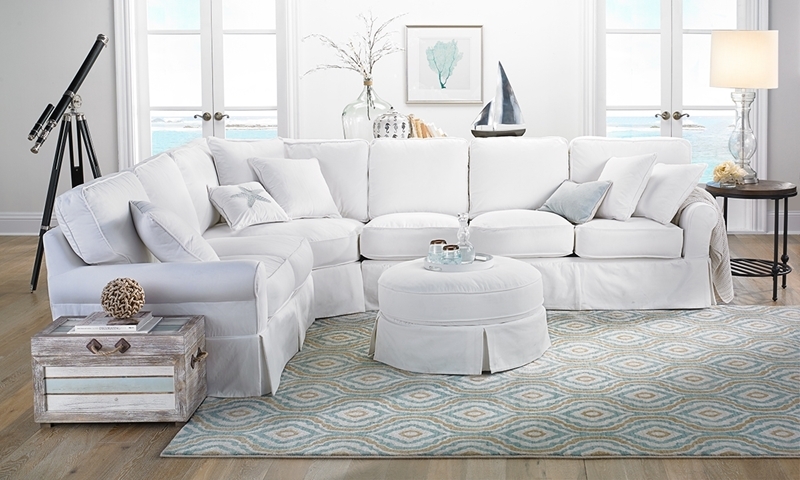 Its removable, cleanable slipcover in pearl white will brighten any space, while the LiveSmart stain-resistant upholstery ensures it stays spotless. A kiln-dried hardwood frame with 8-way hand-tied springs beneath goose down-wrapped cushions ensures long-lasting support and comfort. Slipcovers can be special ordered in an array of colors and fabrics. Round ottoman also available. See store for details. Kit includes left arm facing loveseat, right arm facing loveseat, corner wedge and armless chair.